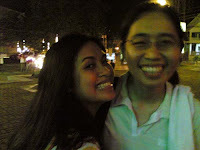 After my trip in Sg and Malaysia, Greg and I flew to Cebu the day after my bday…I was so happy coz, the day after my natal day is Karen’s turn. Not to mention that I haven’t been to Cebu for more than a decade now, regardless of the fact that it’s just a 45-minute plane ride (walay pamasahe hahahah!). Excited and flushed from my previous trips, it was a pleasure to go to a place where familiar faces and intimate hugs are waiting for you. Anyways, one bonus is that kitten is also in Cebu…so the three of us went to have a good time together…wishing Kate is also present (she is in Manila) but grinning like wild dogs because of the fun we are anticipating now that we three have finally found time to be together. Karen is my partner in crime…we both do the dirty work, while Kitten covers for us with her innocent miming look. But before you judge us, it is kitten who is the “palahubog”* in the group…drinking as early as 6am coz she works at night as a telcom specialist. We scoured Ayala for dinner and went to Mango for some karaoke…the karaoke part was kinda hard – we have to wait – a few numbers before our turn, we decided to go to Karen’s apartment so we can stop hauling my luggage – which, by the way heavy…then the inevitable happened…i fell asleep…needless to say. no karaoke happened. Seeing the two of them brings back high school memories. 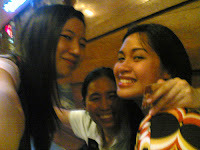 It’s amazing how we’ve managed to keep in touch and remained friends despite schedules and distance. Often called the “Queen City of the South” and the Seat of Christianity in the Philippines, Cebu is the country’s oldest city. Exploring Cebu City, one encounters a rich historic past. Cebuanos are extremely proud of their cultural and historical heritage, a legacy which has endured thru the centuries from the time the great explorer Ferdinand Magellan first planted the cross on Cebu’s shore.